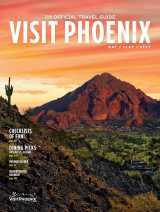 In an online landscape dense with websites dedicated to promoting U.S. travel destinations from coast to coast and border to border, VisitPhoenix.com has been judged the best. VisitPhoenix.com—the official website of the Greater Phoenix Convention & Visitors Bureau—received the 2012 Destiny Award for Best Travel Website last week in Boston, where tourism professionals gathered for the U.S. Travel Association’s annual Educational Seminar for Tourism Organizations (ESTO) conference. Destiny Award judges determined that VisitPhoenix.com exceeded their criteria for Best Website, capturing the spirit of Greater Phoenix in a manner that is at once visually pleasing and user friendly. The site also was praised for its integration of social media, and its use of search filters and Google Maps. “We’ve invested a lot of time and resources in our website over the past few years, and it’s rewarding to have that recognized by our industry peers,” said Melissa Gogel, director of Marketing at the Greater Phoenix CVB. The U.S. Travel Association is the nation’s largest advocacy group for the travel industry, and ESTO is an educational forum designed to help tourism professionals from across the nation better market their destinations. The Destiny Awards annually recognize U.S. Travel members for excellence and creative accomplishment in tourism marketing. This year, the awards were judged by JWT, an internationally acclaimed marketing and communications agency that was chosen by U.S. Travel to develop Brand USA’s national tourism promotion strategy. The Greater Phoenix CVB worked with the interactive marketing agency BarkleyREI on a complete redesign of VisitPhoenix.com back in November 2009. Then, last summer, the CVB and BarkleyREI commenced a six-month redesign to visually differentiate it from other destination websites and make it more appealing to its primary audience (which, internal research showed, tends to be female and over 35 years old). In the months since the re-launch, VisitPhoenix.com has seen significant growth in unique visits, page views and time on site.